Fifteen artists all of whom have registered for this years Bushwick Open Studios will have exactly three minutes to explain what they are showing during BOS, and why it is important. Jen Hitchings, Meenakshi Thurikode, Wendy Klemperer or Kweighbaye Kotee from Bushwick Film Festival are among the invited artists to participate in this "intellectual vernissage." Bushwick Art Crit Group is a newly formed "networking and creative development community that seeks to give Bushwick artists a nurturing place to share about their work, and to receive feedback," says their website. Tonight at 7PM, the group will meet for the second time at the gallery of Brooklyn Fire Proof under the lead of artist Christopher Stout who founded the initiative. The admission is free, and everybody is welcomed to join the discussion. 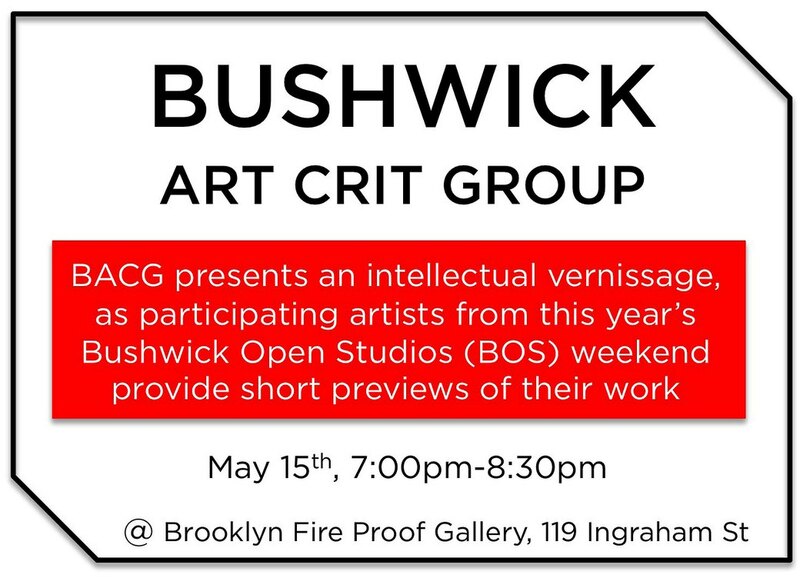 Bushwick Art Crit Group was launched in March 2013, and meets bi-monthly. To learn more about tonight's event, check out our Events Calendar and read an article by Holly Shen Chaves at Arts in Bushwick Blog.